The piano is called the King of Instruments for good reason. It has the widest range of tones and it can play both melody and accompaniment simultaneously. The fact that it’s infamously hefty most certainly does not hurt. Either way, it is one of the most flexible instruments mankind has ever produced, as well as one of the most difficult to use. With Piano Teacher, otherwise known as Pianist: Finger Touch Piano, you can learn the ins and out of this wondrous instrument all by yourself without having to pay any movers to get the darn thing into your house. It also includes a very solid rhythm game where you can learn to play a great assortment of songs composed across the ages. Best of all, the whole thing can easily fit into the palm of your hand! The thought of having a piano that you could cart around everywhere you went was an absurd thought at one time, but that’s exactly what you’ll get here. 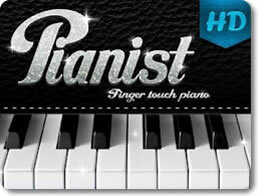 Piano Teacher gives you your own personal keyboard instrument that you can customize to your exact specifications. Create a portable piano that’s suitable for your fingers and your fingers only! Adjust the keys to a size that work best for your hands and platform of choice. Play with one, two or three rows of keys. Choose from three distinct keyboard themes. View keys by their proper chord labels, simple numbers, or via the catchy “do-re-mi” sound theme. Supports multiple languages, including English, French, Spanish, Italian, Russian, Romanian, Korean, Vietnamese, German and Japanese. Turn on the vibration to get a more immersive experience. Piano Teacher is a flexible application that can be used for a variety of purposes. Do you want to play a slick rhythm-based game that uses a keyboard instrument? It can do that. Do you want a tool that can help you learn how to play the piano professionally? It can do that too. How about a creative instrument where you can record and share some compositions of your own making? Piano Teacher is at your service! Play the piano for an extensive musical database. Play Magic Piano to make a game out of learning the instrument. Play and hold the right notes as they approach your onscreen keys. Import MIDI and KARAOKE files into your library and play them on the keyboard. Record and playback songs of your own making. Share your creations on the cloud. 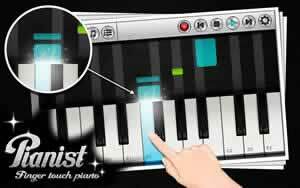 Pianist: Finger Touch Piano is a fantastic app that can be enjoyed by gamers and musicians of all ages. It makes learning how to play the King of Instruments a considerably less daunting affair while being much cheaper than taking piano lessons. If you have any remote interest in music, then you have to check this app out; it’s a masterpiece of programming that demands attention.